This is another all-time favourite in our household. It looks so vibrant in a glass bowl you just want to dig in straight away. 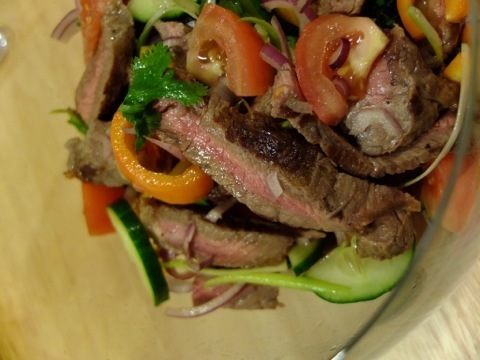 It is also quick and easy to prep and cook, making it an ideal weekday dinner when you have no amount of spare time. If you only have 15 minutes, you could have the vegetables sliced and diced the night before, and have the sauce prepared and bottled in the fridge ready to go. This way, all you are doing when you get home is cooking the steak, the carbohydrate that goes with it (rice of course) and then plating up. Simple! 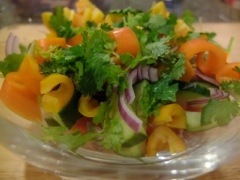 Prepare your vegetables: chop the tomatoes, slice the cucumbers, slice the red onion, juliene the spring onions, pick the coriander leaves, wash and dry them, roll up the kaffir lime leaf and thinly slice through. Prepare your sauce by mixing it all together. Heat a pan. Season both sides of your sirloin with salt, pepper and rub all over with 1 tsp of oil. When the pan is hot, place the sirloin in and cook for 3 minutes on each side. This will be medium to medium rare. Remove from pan and rest on a plate for 6 minutes. On a slight angle, thinly slice the sirloin. 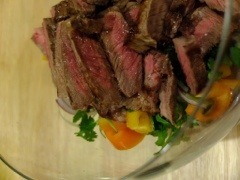 Mix the sirloin with the vegetables and sauce. Taste and adjust by adding more lime, fish sauce or shaved palm sugar. Tear the mint leaves at the last minute and mix through.